Organizational Change provides an essential overview to implementing deliberate and focused change through effective communication strategies. 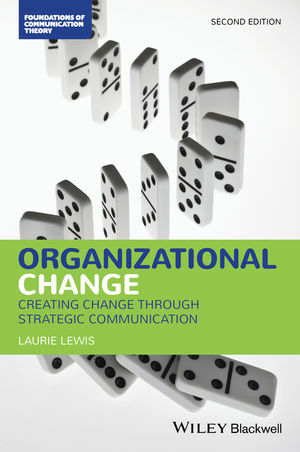 Author Laurie Lewis integrates academic rigor with real-world case studies to provide a comprehensive examination of both theoretical and pragmatic approaches to alterations and modifications of organizational structures. Emphasizing the importance of formal and informal communication in implementation of change, this text investigates methods of information dissemination and examines various channels for communicating change. Coverage of stakeholder relationships, concepts of uncertainty and resistance, assessing change outcomes, and more provides readers with a solid foundational knowledge of change dynamics in organizations. Extensively revised and updated, this second edition provides new case studies on topics such as design of input solicitation, and current research in areas including the persuasive effects of sidedness or inoculation, and socially supportive communication. Improved pedagogical tools, streamlined organization of topics, and additional charts, graphs, and images reinforce efficient presentation of material and increase reader retention and comprehension. Demonstrates how Individuals, groups, and entire organizations can create change and influence implementation. Organizational Change provides a thorough survey of the communication and implementation strategies, methods, and conceptual foundations of change in public and private sector organizations, suitable for undergraduate and graduate study and practitioners with interest in complex change implementation. Dr. Laurie Lewis is a Professor of Communications at Rutgers University and a Fellow at the Rutgers Center for Organizational Leadership. She is co-editor of Volunteering and Communication and the International Encyclopedia of Organizational Communication and has written numerous academic publications on topics related to organizational change, collaboration, inter-organizational communication, and stakeholder communication. Dr. Lewis has provided consulting and training for organizations including nonprofits, civil society organizations, Fortune 500 companies, and higher education institutions.